After huge expectations pre-launch and a plethora of bookings after that, the Toyota Etios appears to be losing some steam when it comes to monthly sales. In September, sales were up barely 9% at 2,951 cars. Now this may not look like a problem, but September 2011 sales are significant because it’s a month when the diesel variant of the Etios was launched (on September 9). However, the response to the diesel variants seems to be lukewarm. While other carmakers have had a huge clamoring for diesel cars which has subsequently spiked their sales volumes, the response isn’t as much as expected in the case of the Toyota Etios. The Etios hit a peak of 5,002 cars in June 2011. That was a month when two things worked in its favor. After the tsunami in Japan in March, June was the month when Etios production got back to full swing and the huge waiting period of months was reduced to just four weeks. June was also the month when Maruti Dzire sales fell to just 2,486 cars from an average of 10,400 cars in the previous months, because of labor-related production problems at Maruti’s Manesar plant. The Etios capitalized on Maruti’s setback. However, in subsequent months (July and August) sales of the Etios fell, touching a low of 2,708 cars in August. Part of this was the hike in petrol prices which has been swing a large number of buyers toward diesel cars, and in the case of the Etios, it was also the anticipation of the launch of the Etios diesel. However, even after the Etios diesel was launched in three variants in September, with prices ranging between Rs. 6.44 lakh and Rs. 7.87 lakh, there has not been as high a rise in sales as was expected. This could be because of the perception that the Etios diesel’s specifications are not that attractive when compared to competing cars. 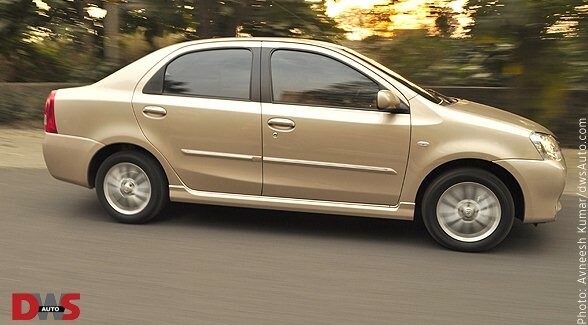 For instance, the Etios diesel is powered by a 1.4 litre diesel engine that puts out 68 bhp of power and 170 Nm of torque. Among its immediate rivals the Dzire puts out 75 bhp of power and 190 Nm of torque from its 1.3 litre diesel engine, while the 1.3-litre Tata Manza puts out 89 bhp of power and 200 Nm of torque. That makes the Etios only slightly better than the Mahindra Verito diesel in power specifications. While the Etios is a spacious car and can seat five comfortably, the feature list and poor noise insulation could also be factors that weigh against it compared to its slightly cheaper rivals – the Dzire and Manza. Incidentally, sales of the Tata Manza and Indigo combined have picked up significantly in September, rising 53% on the back of good discounts and festive bookings. The Etios will also face new competition from this month, as the Nissan Sunny drives up its sales, pitching itself directly at the Etios. The Sunny beats the Etios on space – which so far was the Etios’ strong point, and also has quite a good feature list, though it is slightly more expensive. The Nissan Sunny diesel is expected in a couple of months and that could again affect sales trends of the Etios. What do you think Toyota should do to boost Etios sales? Share your views.